Here at Wineware, we’re just as mad about wine as our loyal customers; we know that even budding wine enthusiasts sometimes struggle when it comes to choosing the right wine decanter! With so much choice to choose from, it’s often tricky to find the best wine decanter to suit your needs. Whether you’re after a decanter just for red wine, or maybe a sleek looking white wine carafe might do the trick? You may prefer something basic or traditional, or you might require a decanter that’s easy to wash and clean. Whatever your preference, we’re sure that we’ve got something to offer everyone from our vast range! 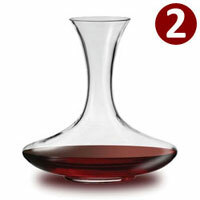 Below we’ve reviewed our top 5 favourite wine decanters for red wine! The Montana Cuvee Wine Decanter is great value for money. 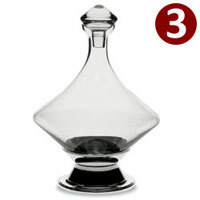 This low cost decanter is supplied in a printed gift boxed which makes it perfect for giving as a present. The traditional shape and slanted lip, makes this decanter ideal for somewhere who’s looking to get into wine and decant reds. The Eisch Glas Claret Wine Decanter is by far one of our most popular. This elegantly handmade decanter features the traditional wide shaped bowl and long neck, making it easy to serve. It sits perfectly on the dinner table and makes serving your favourite red wine that little bit more special. The eye catching and unique Turn Decanter can hold up to 1L in capacity. The way to use this decanter is to remove it from its base (which is supplied) and simple push the decanter on its side so that it completes a circle motion to aerate the wine. A stopper is included too. The modern design ‘Cetra’ Wine Decanter certainly stands out from the crowd! This uniquely designed decanter has two openers, which is very different to standard wine decanters. Simple pour the wine from the bottle into one end, and poor into your glass from the other! Handmade. 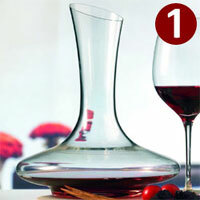 The Menu Red Wine ‘Breather’ Decanter / Carafe is certainly the most effective of the decanters listed in aerating wine. Your bottle will fit directly onto the top of the decanter, with that you turn the bottle and decanter on top of each other and watch the decanter work its magic! The filter motion will aerate your wine as you watch it tickle down the sides of the bowl, perfect! 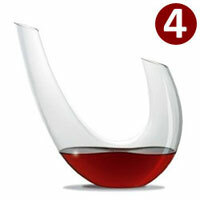 So there we have it, Wineware’s top 5 wine decanters for red wine. Do you agree or disagree? Have you got your own wine decanter that isn’t featured? Then let us know! Contact us via Facebook or Twitter as we’d love to hear from you! Alternatively, click here to view our Top 5 Wine Decanters for White Wine!